Playwright, director and writing tutor Nick Lane talks about his adaptation of Alice in Wonderland – the seasonal show at the Stephen Joseph Theatre which opens today. He also shares his Christmas favourites and his wish for the New Year. 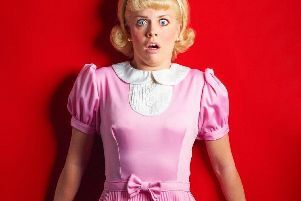 Alice in Wonderland is on at the Stephen Joseph from December 6 to December 30. I’m a writer and director. I used to be an actor but I was in a car crash that put paid to that. This is my third Christmas play after Pinocchio and A Scarborough Christmas Carol, and I’m really excited. I’m from Doncaster and support Doncaster Rovers. With great difficulty. It’s not a story I’d read (or had read to me) as a little kid. Naturally I knew the basic elements so I came to it relatively fresh, trying to look at its fun and sheer oddness as a kid might. That bit wasn’t difficult. Crafting a story was. While the book is full of amazing characters, brilliant imagery and memorable set-pieces, it’s not massively strong on narrative. Unlike Dorothy in The Wizard of Oz – who is desperate to get back to Uncle Henry and Auntie Em – Alice isn’t driven by a desire to return home in the novel, and I really wanted an engine to drive our story along ... so in our play we meet Alice on Christmas Eve, shopping in Boyes with her two kids in tow. All of her memories of having been to a place called Wonderland have been shoved to the back of her head until she happens to see a White Rabbit running between the shoppers’ legs. She chases it into the stock-flow area – leaving her kids outside by a fire extinguisher – and cracks her head on a stock cage, sending her spinning down, down, down... well, you can imagine where to. And when she gets to Wonderland, everything is sort of the same ... but a little bit different. Plus she’s effectively abandoned her kids in a shop so there’s a reason for her to want to get home. If that seems like a lot of info, that’s just the set-up; there are plenty of surprises left. I’ve made Alice, her kids and her sister from Scarborough. As well as the play starting in Boyes, there are other references to Scarborough too – round the back of the theatre is the Eat Me Cafe – how could I not get that in there? It’s a gift. Working with Paul (Robinson, the artistic director of Stephen Jospeh and the show’s director) again. I’m not in rehearsals all the time but when I am it’s just such a laugh.He’s put together another brilliant, brilliant cast. On the days I’ve been in I just sit there with a stupid grin on my face. It’s really great to see what Paul, and Simon who does the music (the songs are ace again this year), and Erin who’s responsible for movement, choreography and loads more, are adding to it. I’m like a kid with Christmas presents. Tough question. There are so many. However, if I was to pick only one it’d be one of the Professor Branestawm books – I absolutely loved them as a kid. The Best of Branestawm, maybe? A lot of the best stories are in there. I’ve still got a copy I had bought for me in my early teens when my original copy fell to bits. I’ll be at home with my wife, Fee, and Ivy, who’s seven ... so dashing about like a mad thing. I do a fair amount of the cooking at home so I’ll be getting into that too. Seeing friends; watching TV, inadvertently knocking baubles off the tree ... the usual. It sounds boring but I prefer giving stuff than getting it back because I tend to ask for really practical things. You know what I really want this year, above all other things? A spice rack. If I don’t get one I’ll use my Christmas money for one. We were never really an “annual panto” family (which might explain why the shows are panto-esque as opposed to full-on panto). We were always skint. I know we saw the odd one ... and I remember seeing a really weird version of The Snow Queen as a six-year old that stayed with me for a while. Can I have three? I’m not religious really – though I absolutely respect it in others if it’s their thing – but I do love a decent carol. I’d say either God Rest Ye Merry Gentlemen or The Holly and the Ivy are up there as my favourite carols - the first one because it’s somehow a bit spooky (just me? Okay); the second because it’s really sweet. There’s an American carol called Carol of the Bells that I like too - that’s got a sinister edge to it as well. Frank Sinatra doing Have Yourself a Merry Little Christmas will get me every time. Dangerous territory here. Again I might have to have a couple – the Alastair Sim version of A Christmas Carol (entitled simply Scrooge) is magnificent, It’s a Wonderful Life beautiful... but for me - and yes; debate rages as to whether it’s a Christmas film or not – it’s Die Hard. Every year when I put the tree up I watch the first two Die Hard movies back to back. They’re just brilliant. I know; I know, Santa’s not in either of them. There again, I’m yet to see a Christmas movie where Father Christmas ties a fire hose round his waist and leaps from the top of an exploding skyscraper, and what’s more festive than that, eh? Eh? Hello? Come back...! It’s just a one-liner, really - Eric’s looking out of the bedroom window as an ambulance speeds by. He watches it go past, waits and then says, “He’ll not sell many ice creams at that speed.” Perfectly deadpan. My favourite bits of Morecambe and Wise were always the scenes when they were in bed chatting about nonsense. As a kid whose mates used to sleep over quite a bit (albeit in bunk-beds as opposed to a double), that made perfect sense to me. Two best mates in their ‘jamas, sharing a room? Yep. What would you dream of? White Christmas or Caribbean Christmas? I think me and Fee might disagree on this – Fee hates the cold so she’d go Caribbean every time, despite how aesthetically pleasing the first fall of crisp snow is. Me, I want a White Christmas (and since it’s my list, bear with me), but under the following conditions: at about six o’clock on Christmas Eve, it starts to snow; small flakes at first, then bigger, fatter ones, drifting slowly to the ground and definitely settling. That way, Ivy heads off to bed dead excited - everyone does, in fact, because we all know it’s going to look amazing on Christmas morning. We wake up and sure enough, it’s perfect – blue skies, bright winter sun and a thick covering of snow. Fantastic. Out we all go, wishing strangers merry Christmas, building snowmen, pulling little kids on sleds and all that... then, on the stroke of three, with a kind of reverse ‘whoosh’ noise, the snow just totally disappears. Gone! No slushy bits that you daren’t walk in, no impacted stuff on the road that you slide about in when you’re driving, and no yellow dog zones. And that’d be snow packed away until next Christmas Eve. I tell you, if I was a weather wizard, that’d be the first weather spell on my list. Finally ... What is your New Year’s Wish? I hope everyone I love, like, know and haven’t met yet are well and happy, and that the people who make the world a slightly less than fun place to live have a firm word with themselves. As for me? I just hope I keep working.